Kalamazoo, MI January 22, 2018 – The Kalamazoo Symphony Orchestra presents the final Family Discovery concert of the 2017-18 season, once again in collaboration with Classical Kids LIVE!. The KSO’s Family Discover Series concerts feature symphonic performances specially tailored to young children and their families. Tickets are only $5 each and include preconcert activities for the family! 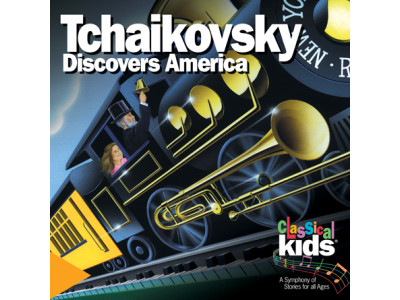 Maestro Brier will be conducting the program entitled Tchaikovsky Discovers America. Based on the actual event, this story tells of the great composer's arrival in New York for the grand opening of Carnegie Hall in 1891 and his famous trip to Niagara Falls. A surprise encounter with a young American girl, Jennie, reveals much about Tchaikovsky; his life in Russia, his love of music and his fears of conducting. This is a poignant story of the meeting of old world influences and new world experiences; a tale of contrast, courage and classical music. Family and student audiences will be captivated by over twenty of Tchaikovsky’s most popular compositions. Movements include marches, serenades and waltzes from Swan Lake, The Nutcracker, Sleeping Beauty, and more! Paul holds an exclusive international licensing agreement with the award-winning Classical Kids organization to direct and produce the highly-acclaimed symphony concert series that includes Beethoven Lives Upstairs, Tchaikovsky Discovers America, Vivaldi’s Ring of Mystery, Mozart's Magnificent Voyage and Hallelujah Handel. As executive and artistic director of Classical Kids Music Education, NFP, Mr. Pement oversees all business and artistic aspects of the Classical Kids Live! theatrical concert productions around the world. (www.classicalkidslive.com) Paul received a BFA in Acting from the University of Illinois and, as a long-time member of Actor’s Equity Association, has extensive theatrical experience performing in over 50 productions throughout Chicago and abroad. He has appeared in such long-running commercial hits as Peter Pan (Peter), Joseph and the Amazing Technicolor Dreamcoat (Benjamin) and Forever Plaid (Sparky), the latter of which he has also directed and choreographed at theatres across the country. In addition to film and television appearances, he has written tolerance-related short films and has directed/choreographed industrial shows for companies such as Target and Mobil. Paul resides in Chicago with his yellow lab, Gus. Roger is a nationally acclaimed actor and musical theatre artist based in Chicago and is proud to be a part of the acclaimed Classical Kids concert series. He has been featured in films and commercials for United Airlines, Sony, Microsoft, IBM, Volvo, Ford Motor Company, Fidelity Investments, S.C. Johnson, Colgate, and the New York Stock Exchange. He has had the privilege to work on musical theatre stages across the country with Patti LuPone, Audra MacDonald, David Hyde Pierce, Michael Cerveris, and Sean Hayes as well as under the baton of Zubin Mehta and Andre Previn. His performances have included appearances at The White House, The Kennedy Center, Walt Disney World and the Ravinia Festival. Regional musical theatre credits include: Juan Peron in Evita, Jacob/Potiphar in Joseph and the Amazing Technicolor Dreamcoat, Harold Hill in Music Man, Barnum in Barnum, KoKo in The Mikado, Petruchio in Kiss Me Kate, Georges in La Cage Aux Folles, Sergeant of Police in Pirates of Penzance and Roger DeBris in The Producers. He currently sings with the Chicago based vocal group Table For Five and, along with his career as an actor, is a practicing Speech/Language Pathologist. Natalie has been seen in four productions of the Classical Kids’ Symphony Concert Series throughout the United States and Canada as well as in Singapore, Kuala Lumpur and Australia. Most recent credits include The Hundred Dresses at the Royal George Theatre at the North Shore Center for the Performing Arts, Welcome Yule with the Chicago Symphony, and the hit comedy Ruthless. Ms. Berg made her professional debut in the Broadway National Tour of Les Miserables as Young Cosette. Other credits include: High School Musical, Bingo the Musical, Little Women, Meet Me in St. Louis, A Christmas Carol, Charlotte's Web, Pinocchio, Annie Get Your Gun, Little Shop of Horrors, Hair, The Man Who Came to Dinner, The Sound of Music and Annie Warbucks world premiere. You may have seen her on TV as a cheerleader in a recent Sears commercial and her latest audio recordings include Kraft Mac 'n' Cheese, The Children's Bible and the Twilight Zone. She earned her Music Degree from Illinois Wesleyan University and is a proud member of Actors' Equity, SAG and AFTRA. Based on the actual event, this story tells of the great composer's arrival in New York for the grand opening of Carnegie Hall in 1891 and his famous trip to Niagara Falls. A surprise encounter with a young American girl, Jennie, reveals much about Tchaikovsky - his life in Russia, his love of music and his fears of conducting. This is a poignant story of the meeting of old world influences and new world experiences; a tale of contrast, courage and classical music.